Social work has historically pulled together the theoretical bases of different professions to inform a “person-in-environment” perspective that is applied to helping disadvantaged populations. In fact, the social work profession distinguishes itself by highlighting the important role of social context in empowering disadvantaged people and promoting human and societal well-being (NASW, 1999). 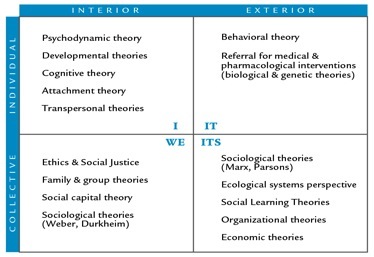 Integral Theory provides a coherent way to integrate the pieces of the biopsychosocial-spiritual puzzle and offers a meta-theory capable of guiding person-in-environment applications. By organizing and integrating various theories and systems of thought, Integral Theory conceptualizes the knowledge base of the profession and explains the nature of social work. It transcends and includes all other social work theories, micro and macro. The upper two quadrants are oriented to the person, and the lower two quadrants are oriented to the collective. The left side is subjective/intersubjective, and the right side is objective/interobjective. The aspects of reality represented by these four quadrants mutually interact with one another and evolve together. Larkin, H. (2006). Social work as an Integral profession. AQAL: The Journal of Integral Theory and Practice, 1(2), 320 – 350. Thomas, P.E. (2004). Toward the development of an Integral approach to social work: Implications for human behavior theory and research, Journal of Human Behavior in the Social Environment, 9(3), 1 -19.